It seems really weird to think back to a time when your mobile phone couldn’t do the jobs of a dozen other devices. Now that smartphones have supplanted everything from compasses and Rolodexes to voice recorders and watches, we rely on them to do dozens of things. Add to that list “count my steps,” as newer smartphone models often double as fitness trackers. Both Apple and Samsung have recently added hardware to their smartphones to help leverage the dozens of fitness apps available in their app stores. Apple’s M7 processor, currently in the iPhone 5S, iPad Air, and iPad mini with Retina display, collects data from the device’s sensors (accelerometer, gyroscope, and compass) and then provides that data to the apps. Here’s the breakdown of each app’s features and flaws. Oh, and a few charts to give you a side-by-side comparison of the step data. The day I used all the apps at once, you can see how the iPhone 5s apps that use the M7 data had similar (sometimes identical) step counts, and the iPhone 4s apps lagged behind. I was initially attracted to Pedometer for M7 – Steps for its incredibly clean interface. 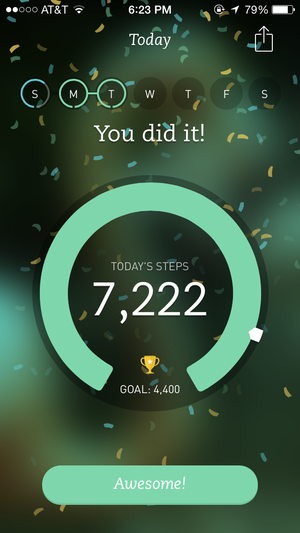 The Steps tab shows you a step count for the day, for the week, and the month, in black text on a white background. That’s it. You can swipe left and right to see other days, but none of the data in this view is interactive—that is, tapping on it doesn’t show you any other info. But tabs along the bottom let you switch to a graph view that shows your activity for the month, and a list view that lets you scroll through a list of dates. According to the tutorial, the app runs in the background once a day to fetch step data and requires little battery use. However, because it requires the M7 processor, it doesn’t run on any handsets earlier than an iPhone 5s—so I couldn’t run it on my iPhone 4s to compare. In my testing, Pedometer for M7 was fair: Its step count was often spot on with other apps that use the M7 processor; often they all shared an exact step count. For example, on June 20, Pedometer for M7 clocked me at 2584—exactly the same step count as Walker M7, Stepz, and Pacer for iPhone 5s. Like Pedometer for M7, free app Stepz relies on the M7 processor—meaning it doesn’t work on the iPhone 4s. The difference is the design: Stepz has a brightly colored interface that gives you just a hair more functionality than Pedometer for M7. 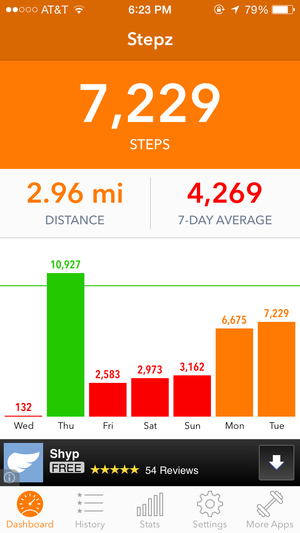 Stepz’s vibrant dashboard contains color-coded boxes that display your step count for the day, distance in miles, and 7-day average. Below this, a bar chart with a green line indicates your step goal. Days that you hit that goal are indicated in green, days you miss are red, and the in-between days are orange, making for a colorful visual guide. 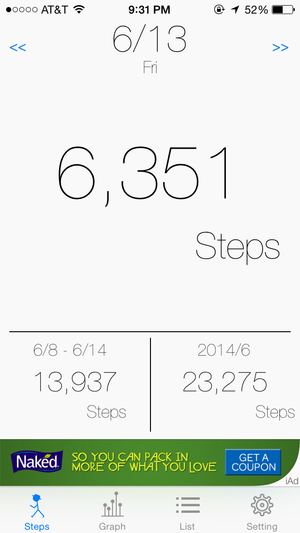 Tapping on the days here (and in the stats view) will change the bar graph from steps to miles. 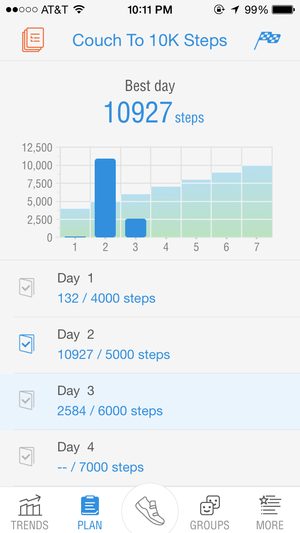 In the stats section, you can also view your steps by days, weeks, and months, and Stepz’s history screen is much like the list view in Pedometer for M7—and that’s pretty much it. 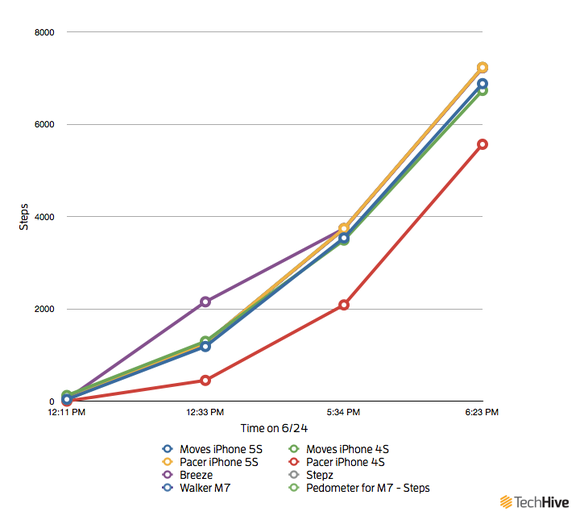 Stepz echoes the results of the other M7-only apps pretty much to the step: On June 20, Stepz had the exact same step count as Pedometer for M7, Breeze, and Pacer (iPhone 5s), and on our starting test on June 24 it had the same step count as Walker M7, Pedometer for M7, Breeze, and Pacer (iPhone 5s). It’s a bit more interactive and useful than the basic-bones Pedometer for M7, but still pretty simple and straightforward for those who are just getting started. The next step up (…yuk yuk) is Walker M7, another free app that relies on—you guessed it—the M7 processor. Walker displays your step count data inside a circle on the main screen. The blue line that outlines the circle indicates your progress towards that day’s step goal. To the right of the step indicators, select whether you’ll be walking or running, or tap the plus sign for both: this helps Walker track your steps more accurately. This screen also shows your distance, estimated calories burned, the time you’ve spent moving, and even your speeds. The Menu button in the upper-right conceals more data display options, like lists, charts, statistics, maps, and rankings. The charts view lets you toggle between steps, distance, and calories, as well as between the walk, run, or both. Sliding to the right for charts that display your weight, body fat, and blood pressure—all data you’re required to input yourself on the home screen. 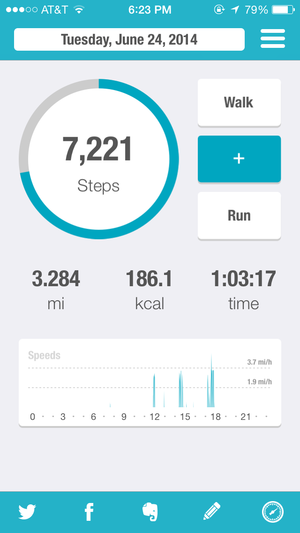 Although Walker pulls pretty much the same step data as Stepz and Pedometer for M7, it has a ton more functionality. Because you can manually enter in data on weight, body fat, and blood pressure, it’s ideal for those who are tracking their activity for health-related reasons. It performed solidly against the other apps: Walker was often within of few steps of, if not spot on with Stepz, Breeze, and Pedometer for M7. Pacer, one of the two apps here that also works on the iPhone 4s, is much like Walker in that it helps you track health metrics like weight and blood pressure. It even has a playlist feature and health plans to help you be more active. Unfortunately, the playlist feature was buggy for me on the 5s—I could add power songs from my iTunes library, but not play them. Pacer’s main screen shows your step count for the day, active time, and estimated calories burned. This screen also shows your activity level for the day and your progress to your goal. Swiping right from the goal data shows a graph of that day’s activity, and swiping right again takes you to session data where you can tap a button to start a session—for when you go on a run or a long walk, for example. Pacer has three fitness plans built in: Couch To 10K Steps, Walk 4 Weight Loss, and Build Your Own Plan. The plans offer goals for you to aim for—for example, Couch To 10K Steps gives you a list of daily goals and also displays your daily steps so you can see how close you got. I would love a more fleshed out offering here—notifications, or pop up motivational boxes, or something. The groups option lets you compete against friends, like the rankings option in Stepz. The “more” section has options like syncing to MyFitnessPal and backing up your data. One of the things I missed most in Pacer? A map to show where I walked. Pacer was pretty close between the iPhone 5s and the iPhone 4s, but I think the 5s was more accurate thanks to its M7 chip. 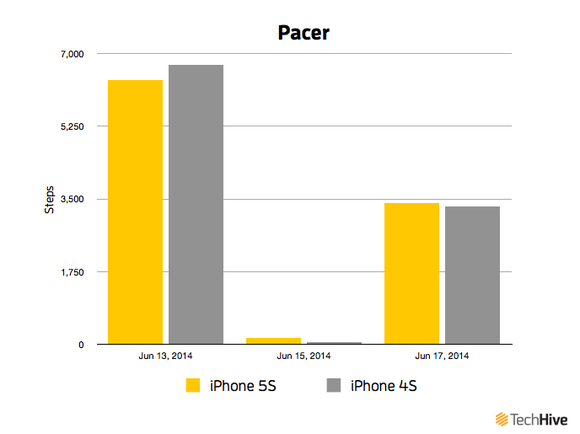 Using Pacer was illuminating because I could run it on both the M7-equipped iPhone 5s and the iPhone 4s. The difference was stark: For example, as I type this, the Pacer app on the 4s shows I’ve taken a total of 286 steps today (impossible, as I’ve walked several blocks), while the Pacer app on the 5s shows a more realistic 1440 steps. This happened again and again over several different days—the M7 processor consistently had a more accurate step count than the iPhone 4s was capable of. Breeze, another M7-only app, is brought to us by RunKeeper. Breeze shows how much of your personal goal you’ve achieved that day, as well as if you’re on pace to meet it. 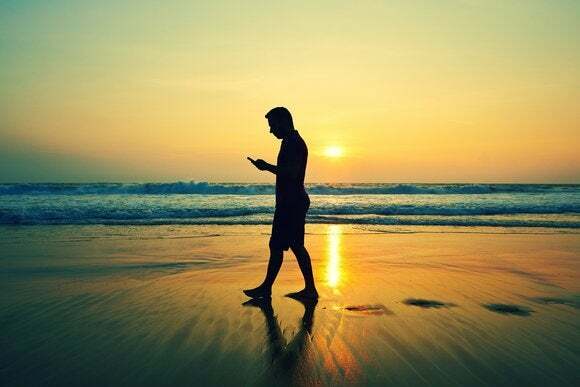 For example, checking Breeze in the afternoon can tell you that you’ve taken 2771 steps, and also that you should be about 25-percent further ahead in order to achieve today’s goal of 6400 steps. Breeze’s home screen displays this data in a circle, over beautiful background photos. As the week progresses, a group of seven smaller circles (one for each day) fills up depending on how much of each day’s goal you completed. Tapping on one of these completed days takes you to the full set of data for that day, plus your longest activity, whether you got more steps from walking or running, and your goal streak, which is how many days in a row you’ve hit your goal. Tapping at your longest activity a graph of your activity, plus a weirdly undetailed map—here Breeze often was unable to locate my position, but even when it did know where I was, the map didn’t show my route, just a bubble over with that activity’s step count, and a motivational prompt. Breeze’s message screen shows tons of messages on your progress, and the app loves to send motivational push notifications too. Unique to Breeze is its “spirit animal” screen—I’m not sure why it made my day to be told I was a “Mercurial Lion,” but did. The spirit animal section also shows your most active times of the day and days of the week, and which type of activities you’re most often engaged in. It’s a neat way to play to Breeze’s strengths. The only app on our list that’s as pretty as Breeze is Moves, a free app that doesn’t rely on an M7 processor, so it works on both the iPhone 5s and the iPhone 4s. Moves is a scrollable timeline that charts your movements, including steps and location, throughout the day. The timeline tells a story of your day, showing your starting point, each leg of transportion, and each destination. Moves is incredibly well designed—everything that you touch works just like you’d expect it to. Circles show your tally for steps walked and run, as well as distance cycled, and you can tap those to toggle between steps, distance, and total time. Scrolling down shows you the tmeline, and you can swipe left and write to navigate to other days. Your timeline shows a list of locations: for example, “San Francisco Public Library” if the app can identify a location, “unknown location” or “Place in Laurel Heights” when it can’t. You can name unknown locations (work, home, gym, whatever) to have Moves remember them for next time. Colored lines between the location bubbles show times you were moving. You can tap any location or movement line to see it on a map. It’s fun to see your routes highlighted in colors on the map—green for walking, blue for cycling, gray for cars or the bus—and you can edit the activity type if moves got it wrong. If you want to get really specific about your day, tap “more” to check out an extensive list of activities, from skateboarding to sailing to wheelchair to underground train. The tiny M icon holds the settings, including options to connect Moves to other app, and the ability to share a summary bubble or a storyline. 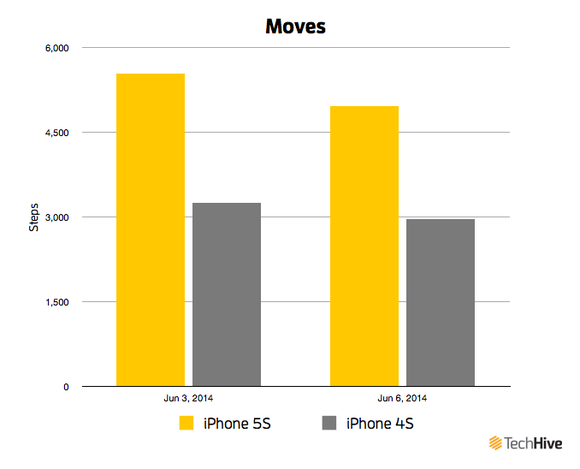 Moves on the iPhone 4s lagged way, way behind Moves on the iPhone 5s. I tried Moves on the iPhone 5s and the 4s, and again, the M7 processor made a huge difference: The 5s consistently counted more accurately, which was most noticeable on days where I didn’t leave the house at all. For example, on June 18, Moves on 4s counted just 41 steps, while Moves on the 5s counted 99. 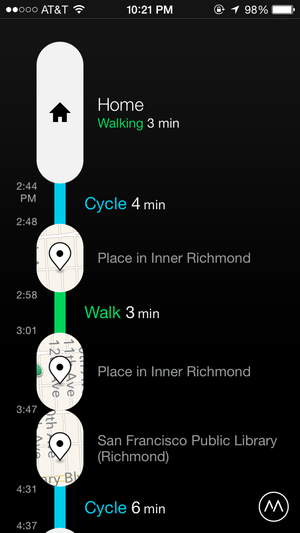 Moves is also the only app here that could distinguish my bike rides from my walks. However, there’s a drawback: Facebook bought Moves in April. As recently as May, there was rumbling about what kind of data would be shared between the two. (The official word from Facebook is they have access to Moves’ data for technical maintenance and “developments of the service that improve the experience with that app.”) Disappointed users deleted their accounts and tanked the app on the App Store—it currently has 192 one-star ratings. That may or may not be a deal breaker for you, but it’s definitely something you should know. Moves' potential data sharing pushed me back to using Breeze—something I was more than happy to do, because I like both its functionality and design. Walker offers a lot of data, but Breeze organizes it better. The other apps either didn’t offer enough functionality (Pedometer for M7, Stepz) or focused on features that weren’t as important to me (Pacer’s plans and groups). The M7 processor made an undeniable difference in the accuracy of the step count, but it’s worth noting that it still wasn’t as accurate as the wrist-worn Garmin device that I wore at the same time—because my wrist still goes more places with me than my phone. However, if you don’t care to drop cash on a dedicated fitness device, your iPhone 5s is more than capable enough of getting you started counting steps.